These things are so freaking yummy AND easy. I cam across the recipe on Facebook, and I admit to baking them a little bit longer so they’re a darker brown but that didn’t affect the taste! When I munched after they’d cooled, I wrapped one in a paper towel and zapped in the microwave for about 20 seconds. Eating them warm is The Best! Preheat oven to 350 degrees. Grease cups in muffin pan generously. Crisco butter-flavored spray worked great. Do grease the the cups well or the muffins WILL stick. In medium bowl, stir together brown sugar, flour, and pecans. In a separate bowl, beat the butter and eggs together. Stir in dry ingredients just until combined. Spoon batter into muffin cups about 2/3 full. Back for 12-13 minutes for mini muffins or 15-17 minutes for regular size muffins. Run a knife around the edge of each muffin and pop it out. Store in air-tight container. My full-sized muffin pan makes a dozen, and that’s what these measurements made. You can also place a pecan half in the center of each muffin before baking which makes them look pretty. 😉 Now I need to go make another batch of these. 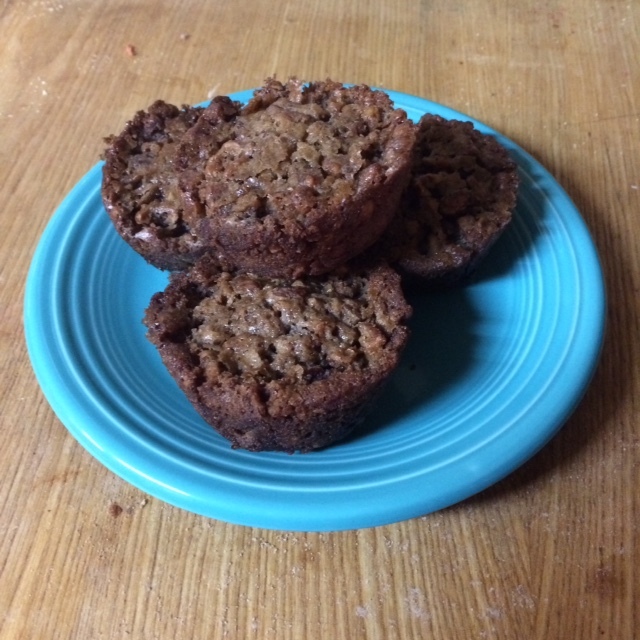 This entry was posted in Writing Life and tagged family, food, recipe, Tuesday Treats. Bookmark the permalink. Ooo, evil! Definitely going in my keeper recipes. Thanks! They’re not super sweet but very yummy. And soooo easy! Makes a quick treat.